So, yeah blogging two days in a row can you believe it? Hopefully this will become more the norm. I am working at making time for the things that enrich the parts of me that are so very easy to neglect. Good for me, good for you… er sort of. I came upon a parenting fix today I just can’t help but share, gross as it is. We spent Thanksgiving at my mother’s house. It was lovely, as her get-togethers always are. I wish we could visit her more often, but she lives 8 hours away. We have become somewhat accustomed to the drive, however this time was a little different. Little Bunny has just moved from a rear facing car seat to a front facing one. In many ways this has been a wonderful change for her. Not so however on the long drive to grandma’s. Twisty mountain roads, the front facing seat, and road food disagreed with her little tummy and we wound up with a barf-o-rama coming and going. I washed the car seat cover with no problem, but was not able to really clean in all the little plastic nooks and crannies of the seat. Until today, when I came up with the idea of giving the car seat a bath. I filled the tub with hot water and a little bleach, and let it soak. You will thank me most kindly for not sharing a picture of the bath water, believe me it’s worse than what your mind conjures. But I will tell you it worked like a charm. The seat is ready for more road trips but I need to pack a special “barf bag” to keep in the car. I’m wondering if any of you have had to deal with this problem and can offer any tips or advice? I got a LOT of knitting done. Guess keeping the fingers off the keyboard allows them to work the needles a little better huh? First up COBBLESTONE by Jared Flood. I finished it right after Halloween. This is the first sweater I’ve ever knit for Mr. Slippers, he agrees it was worth the wait. Plus, the success here has prompted the beginning of a Dale of Norway fair isle in a similar shape. 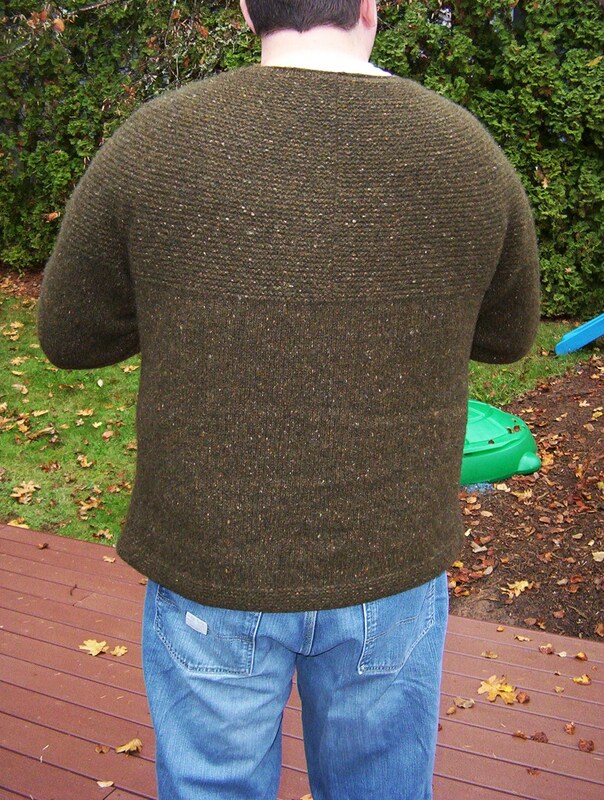 And I am considering making him a Retrograde Pullover cause I just can’t resist the look of that raglan shaping on those broad shoulders. Could you? Alrighty then, back to the needles for me. More soon, including a recap of NaKniSweMo (yep, I did it!). You are currently browsing the Bunny Slippers blog archives for November, 2007.